Nashville, TN (July 22, 2013) – Breakout country artist Kyle Park honors his greatest musical influence, George Strait, with the release of his brand new single “Fit For The King” to the Texas Music Chart and Texas Regional Radio Report today, 7/22. Solely written and produced by Kyle, the clever tribute weaves lyrics from 31 George Strait songs into a story about heartbreak. 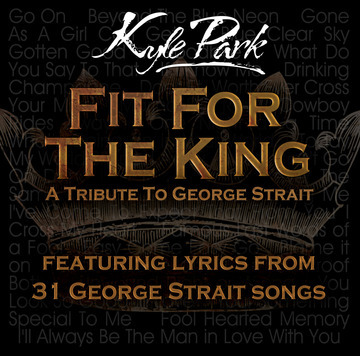 Directed by Paul De La Cerda, the “Fit For The King” music video features unique footage of George Strait in concert and memorabilia combined with Kyle’s exhilarating live show. “Fit For The King” is the follow up to his back-to-back, #1 smashes “True Love” and “The Night Is Young.” Featured on his current album BEGGIN’ FOR MORE, the song is already garnering buzz amongst radio. The Austin native first hit the music scene in 2005 with the album BIG TIME followed by 2008’s ANYWHERE IN TEXAS. In 2010, he released two EPs. His breakthrough 2011 release, MAKE ME OR BREAK ME, delivered the hit title track, which earned Kyle a #3 spot on the Texas Music Chart and stayed in the Top 10 for over six weeks. Kyle has quickly become known for his top-notch, energizing live shows and growing loyal fan base, securing his name an honored spot on the back wall at Billy Bob’s Texas, right alongside Pat Green, Blake Shelton, Alabama, Brad Paisley and Tim McGraw. For tour dates and more, visit KylePark.com.